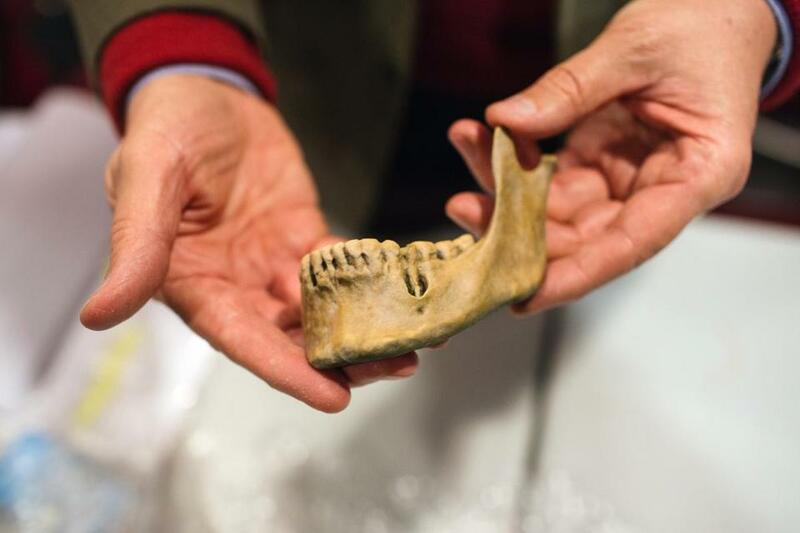 A replica 3D printed model of a lower jaw from one of the excavated soldiers found on Durham University grounds in the UK made its way to Saugus. Heidi Thibodeau scanned the room, studying the faces of 29 strangers gathered at a private meeting before a public talk. “We’re all cousins,” she supposed, considering that the people in the room, descendants of 17th century Scottish prisoners of war, might be blood relatives. The thought made goosebumps rise on the back of her neck. What had become of the Scottish soldiers who died during captivity following the 1650 Battle of Dunbar? Three years ago, during a campus excavation on a historic site where a new dining hall was going up, the British archeologists found the tumbled skeletons of about 29 men in two mass graves. 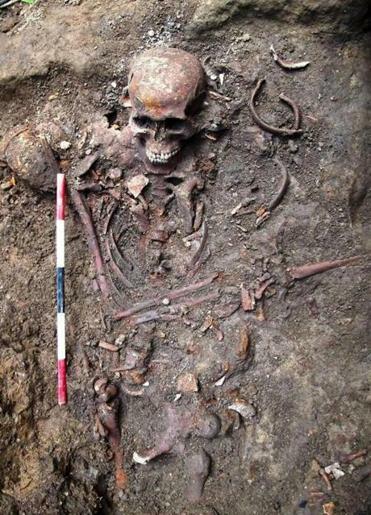 Almost two years later, radiocarbon dating, dental examination, and other scientific tests confirmed the scholars’ initial conclusions: The dried bones were the remains of the Scottish soldiers. But it was further research — which the archeologists are continuing — that has yielded important facts about the lost soldiers’ early lives, everything from childhood nutrition to social customs such as smoking clay pipes. For Thibodeau, a corporate library assistant who grew up in Stoneham and now lives in Connecticut, and for her virtual cousins, this offered a way to connect the dots, linking them to Scottish ancestors who had survived the English civil wars. The discovery also boosted family pride. Perhaps the grit and stamina that had sustained their ancestors through the war, the exile to New England, and forced labor for up to seven years — including at the Saugus Iron Works — was also in their DNA. The estimated 35 to 37 men sent to Saugus — then a part of Lynn — had been among the lucky ones. They lived through a brutal war, imprisonment, deprivation, and hard labor before earning their freedom and going on to live productive lives. But it was the men left behind and forgotten in unmarked graves who linked the present to the past. The excavation sight in England. The meaning of the discovery cast an even wider net. Sons, brothers, husbands, and fathers missing for centuries could now be mourned and honored — and laid to rest. “It was an incredible experience. The research of those who didn’t survive brought my own ancestors alive for me,” said Thibodeau, whose ancestor James Taylor worked at the Saugus Iron Works around 1653. The researchers found the men in the Dunbar graves probably died from their poor physical condition and infectious diseases after being taken prisoner by the English during the Third Civil War. Meanwhile, another 250 Scottish POWs were exiled to the New England colonies. About 150 made the journey aboard the ship Unity in 1650; an additional 100 were taken the following year, making their passage on the John and Sara after the 1651 Battle of Worcester. 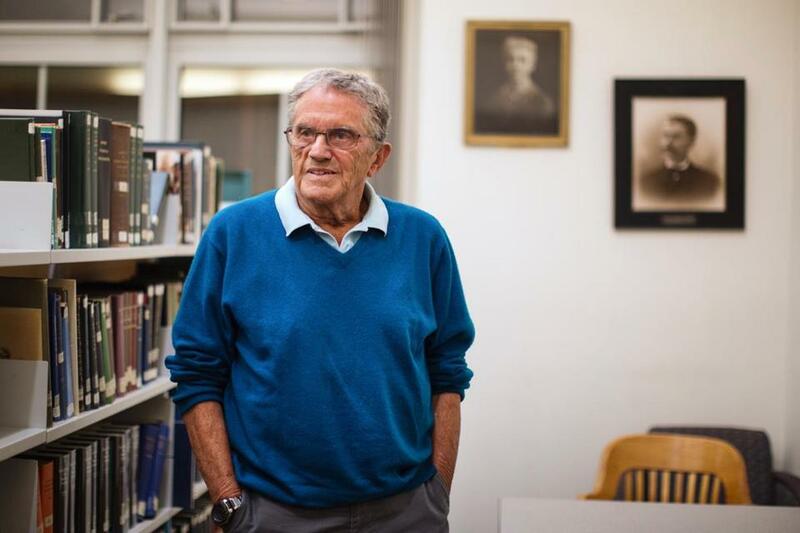 William Munroe of Lynnfield came to Saugus to hear about his namesake ancestor. Among those hardy survivors was William Munroe, an ancestor of Lynnfield resident William Munroe, who fought against the English at the Battle of Worcester, a year to the day after the Battle of Dunbar. Many more William Munroes were to follow: the Lynnfield William, who is 87 and a commercial artist, was named for his father; both his son and grandson carry the family names. It isn’t just the descendants who feel the emotional tug of the past. The discovery also draws attention to a human conundrum that’s as modern as it is old. There is also the issue of slavery. While the history books describe the Scottish POWs as indentured servants, some scholars point out that the soldiers were forced immigrant laborers. “What many people don’t realize is that the distinction between slave and servant was blurred in the 1600s, not only because the language was imprecise but also because there were so many types of and reasons for servitude,” said Diane Rapaport, a professional genealogist in Lexington who has written widely about the Scots in colonial America. But in time, Rapaport said, the Scots gained their freedom, bought land, married Puritan women, and produced large families, unthinkable for the African and Indian slaves who were never welcomed into colonial society. ■ In 1650, 150 Scottish prisoners who were taken by the English Parliamentarians in the Battle of Dunbar boarded a ship in Gravesend, east of London, bound for New England; 60 were intended for the Saugus Ironworks, owned by The Company of Undertakers of the Iron Works in New England. The company was founded in what was then known as Lynn by John Winthrop Jr. and several other colonial entrepreneurs. ■ The Scots were placed in four-man houses and allowed to work the land for four days; they worked for the Iron Works the other three days. ■ Two versions of a 1653 inventory of the Iron Works have been found. One named 35 men and the other 37. Those not employed by the Iron Works were sold for between 20 pounds and 30 pounds each and put to work in Massachusetts, New Hampshire, and Maine. ■ Most served for seven years. Some at the Saugus Iron Works who were able to gain their freedom became successful farmers in Maine. Workers is Saugus used large hammers to force impurities from the iron. 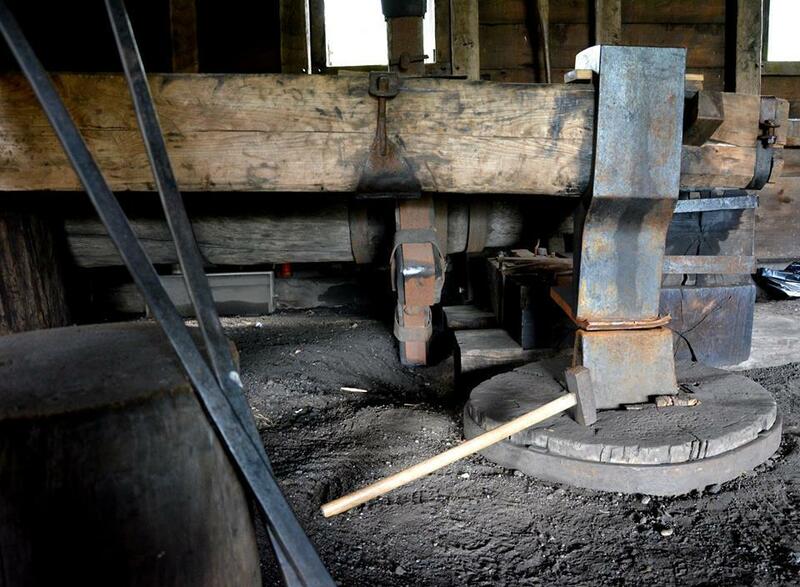 This 500-pound trip hammer was powered by a water wheel.